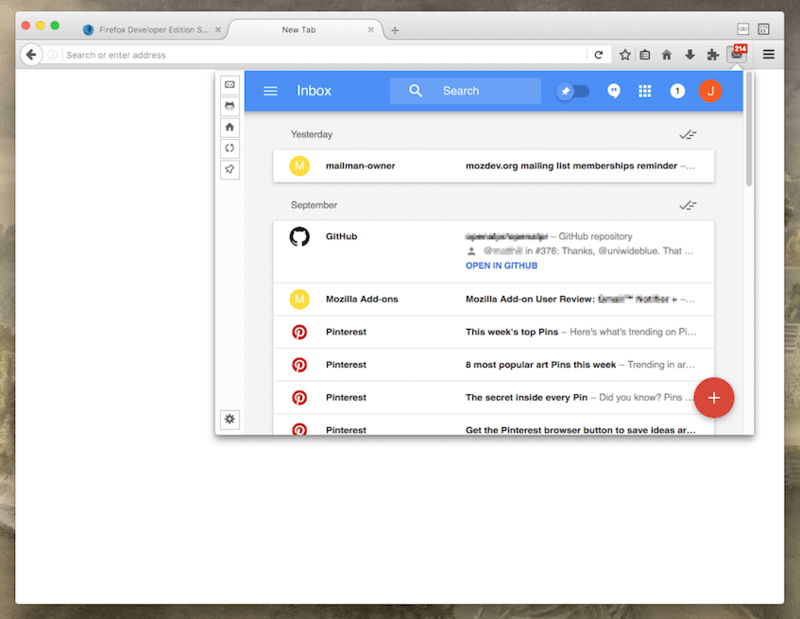 "Notifier for Inbox.Google.com" is a notifier for Google's new web based email client. This extension adds a toolbar button to your Firefox browser. The toolbar button displays the number of unread emails in badge area. Pressing the toolbar button loads inbox.google.com in panel view for easy access. Please note that the sole purpose of this extension is to provide an easier way to have access to this email client, and there is no intention on misleading this product is an official product. What is the "Notifier for inbox.google.com" add-on and how can I use it? This extension aims to ease your inbox access by proving a toolbar button and a panel attached to it. The idea is to load the official inbox.google.com inside a panel view and get badge and desktop notifications in order to get notified of the total number of unread email you have as well as once a new email hits your inbox. Badge text is the total number of unread emails you have in your inbox at the moment. This number gets updated once a message is marked as done (in inbox interface there is archiving buttons; when you are done with an email press done button) or a new email is arrived to your inbox. It might take up to 10 seconds for the badge text to get updated. Note that since inbox.google.com does not provide any number in the interface, this number is extracted from Gmail's feed. Note that the number belongs to the total unread email in the current account. If you have multiple accounts, go to the options page and adjust the link to get the badge for the account that you are interested. I have multiple Google accounts and I would like to get notifications for the second account. Is it possible to configure the extension to listen for the second account instead of the primary one? Yes, by default, the extension checks and displays the badge number based on the total unread emails in your primary account; however, it is possible to configure the extension to listen to the another account as well. Just open "about:addons" in a browser tab find the extension and hit the preferences button (you can open preferences page from the panel as well). Now change the inbox.google.com URL to the one that you would like the extension to install listener for. For instance to listen on your second account, insert https://inbox.google.com/u/1 (note the number one at the end of the URL) in the box and wait for the extension to update itself. When the URL is changed from options page, the panel also displays the inbox for the newly selected account. Also you will get desktop notifications only for this account account. What does happen if the URL in the options page is set to the second account (e.g. https://inbox.google.com/u/1) and I am only logged-in in a single account? If you are not logged-in into multiple accounts, the extension simply ignores the provided URL and listen over the primary account. Once the second account is available, you will get notified for the newly added account. Does this extension support multiple accounts? The extension can only show desktop and badge notifications for a single account at once. So you need to decide which account you want to get notified from. So basically it is possible to set the default account from the options page but it is not possible to get notified for all the logged-in accounts at once. Why there is no time interval for email checking in the options page? The extension installs an observer which gets notified when an email is marked as done or a new email hits your inbox. There is no periodic check to update the badge like what other extensions do. This is a more optimized and accurate why for getting notified on changes.